The editor introduces this volume of papers read at a symposium in November 1974 and outlines the recent history of urban archaeology in this country. 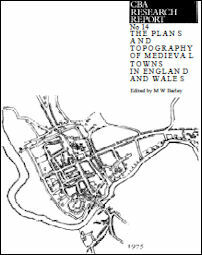 D M Palliser (pp 1-7) surveys the use of documents, standing buildings and below-ground archaeology for urban topography. H Carter (7-19) selects geographical aspects such as the influence of topography on urban form and statistical measures for street systems and plot shapes. The evolution of pre-Conquest planned towns is Martin Biddle's subject (19-32) and of post-Conquest plantations, L A S Butler's (32-48). The natural growth of towns (e.g. through markets) is surveyed by Colin Platt (48-56), post-Conquest defences by M W Barley (57-71), and suburban growth by D J Keene (71-82). Summaries of the discussion following each paper are provided and further problems needing research are defined.